Faculty support can take many forms, but one of the most critical identified by our own faculty is the need for more recognition programs to honor the fine work being done by our scholars. The Carolina Women’s Leadership Council is addressing the need by establishing three awards each valued at $5,000 to be given annually. 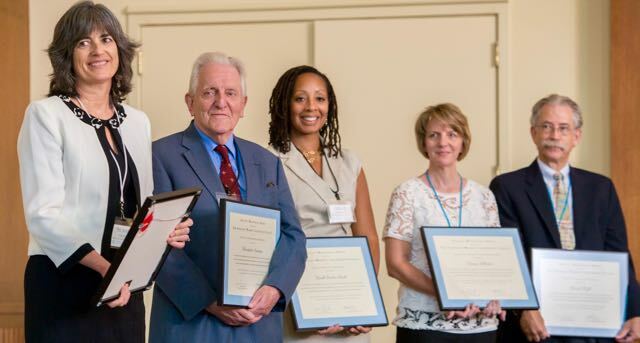 One honors faculty-to-undergraduate-student mentoring, one honors faculty-to-graduate-student mentoring, and one honors faculty-to-faculty mentoring. Typically, the call for nominations for the Faculty Mentoring Award goes out each year early in the fall, with nominations due in mid-January. Nominations are submitted via the Office of the Executive Vice Chancellor and Provost Web site. Winners are selected in mid-February, and awards are presented at the annual meeting of the Carolina Women’s Leadership Council in late February. Nominations for the Faculty Mentoring Awards typically open during the Fall semester, with a January deadline. These dates are subject to change. The process is handled by the Provost’s office. You can make a gift to the Faculty Mentoring Award today. Go to giving.unc.edu/gift. Under “Gift Designation,” select “Other.”Under “Please select a School/Unit/Program,” select “Other” and then, under “Please select a Fund,” select “Other.” This will enable a “Search Funds” tool—enter “Faculty Mentoring Award” in the search field and follow the steps thereafter. Mail your check, made out to UNC-Chapel Hill with “Faculty Mentoring Award” in the memo line, to the Carolina Women’s Leadership Council.